Newcastle 19 ‹ Series 12 Reversions ‹ Flog It! Antiques series. Paul Martin presents from the Discovery Museum in Newcastle. The items uncovered include a book of autographs with a local connection. Browse content similar to Newcastle 19. Check below for episodes and series from the same categories and more! and on this side of the River Tyne is the town of Gateshead. the location for our valuation day. has a strong connection to our valuation day venue. the site of our valuation day. and the site of our valuation day. of trade bodes well for us later on in the auction rooms today. here in the centre of Newcastle. And our queue is growing. and already we've had to move lots of people inside. There's a real feeling of anticipation in the air. to go through to the auction later on. And I know two people who can't wait to get their hands on the items. Tell me what you like about it. It's all the animals and all the detail around the edges. -What have you got with you? on the top floor of this impressive conversion. wonderfully diverse range of objects that are arriving here in Newcastle. who can't wait to swap their carvings for a holiday in Benidorm. behind an autographed book of famous signatures. First up, it's Adam Partridge, who's raring to go. he spotted in the queue earlier. -And how did you become friends? -And how do you enjoy yourselves? -We like to go out as often as we can. -Go on holiday as well? Benidorm. We went to Barcelona. -Anyway, down to the items you brought. Let's start with the coconuts. -How did you come to own them? but I've had them about 38 years. Did grandfather travel? Was he a seaman? No. I don't honestly know anything about them. is a seaman. Do they live out on display at home? -That one's quite badly damaged. -Is that why you brought them in? -Are they hidden in a box? -And where is the box hidden? -On top of the wardrobe. -On top of the wardrobe! -You know, they're no good to me. -If somebody else would appreciate them. Yeah, well, I think they will. and they're nicely carved, aren't they? And then mounted on this little turned mahogany bases with covers. I think they're very nice. I think they're about 100 years old. and hopefully they will go on and make a little bit more. Brilliant. That's fine by me. How did you come to own this object here? -and put it straight in the cabinet. -You said, "I'm having that." You do see them quite often. In fact, most sales you'll see one. -But quality of carving isn't bad at all. -That's what I found intriguing. -I think there's several balls inside there. and that's where it's been broken off and re-glued. But it's a nice thing, isn't it? Are you going to miss it? Well, I just brought it as a last minute thing. I didn't think it was worth anything. -Yes, it sounds fair to me. -I've now took it off him. -Well, I'd put a reserve of 50 on that. -Estimate 50-80. Might make 100. -So we're going to go off to auction with these now. and we're going to put these in at £30-£50, no reserve. and an estimate of £50-£80. -till it comes out on telly in four months' time. So, between them, we might get 150 quid, you never know. That would be fine. That would be all right. found their way from the other side of the world to Newcastle? valuation day is you never know what you're going to find. right here, right now, on 'Flog It!'. Joan, I love to see a big chunk of gold sitting on the table. It's what people want to buy today. Can you give me a wee bit of background about it? Where you got it? Who it belonged to? Where it came from? as I can remember as a small child. -who is still alive, but she gave me it about 40 years ago. Many people, or many girls, wore them as neck chains. Might have been even the '60s actually. But I only wore it a couple of times. Far too heavy for an evening. Well, you know what it is. and your watch would be attached to this chain. and it looked very smart and very elegant. where we have two little clips here. It's missing a T-bar, but I'm not too worried about that. Now, this chain is 9-carat gold. -because it's marked .375 on every single link. That means that there are 375 parts per thousand of pure gold. They would add other metals, just to make it more durable. and that would have hung on the outside of the waistcoat as well. and people will take that into consideration when they buy that. -and was this also your grandfather's? I can see that it's ticking away. Your second hand here is moving around the dial. -This watch is a gold plated watch. There is no quality in the plate. on the Albert, sovereign and watch - put them in as one lot. -Would you be happy to sell it within that estimate? It's a reasonable amount of money. What would you do with it? and her partner, so put it towards that. -A bit of shopping in Prague? that you have to make an appointment to see. one of the oldest and most extensive collections of taxidermy. by such an array of creatures, many of which are now extinct. Dan, what's the importance of this collection? Well, this collection, um, we have records for over a million objects. -And things that are extinct. What have you picked out to show me? This is probably the most valuable piece in the collection. Is that because it's extinct? This is a great auk. because it's actually a juvenile bird. And do you know what? This is almost unique. when it was young and when it was growing. -..of life that no longer exists. that they kept a record of it. The piece next to it looks typically Victorian. Yes, this is a piece by John Hancock. The namesake of the Hancock collection. -He was an ornithologist, wasn't he? and I think that that informed his taxidermy. how their bodies were made up and you can really see that. have been vital in documenting world species. Let's head back up into the light now for our next valuation. Sally, these are a fine collection of trophies you've got here. -How did you come by them? and he was working for the Sudan Plantation Company. Oh, OK. In what capacity? Do you know what he was doing out there? it was all geographical surveys, really, is what they were doing. I see. And what was his name? -And did you know him? -No, I never met him. -and died in South Africa in the late '50s. it just looks a few bits of silver on a table, doesn't it? and these, I think, tell a story of Sudan in the 1920s. they were around the world. These are British silver with Birmingham hallmarks on them all. and then obviously shipped out for that specific event. So we've got a range of trophies here. This one was 1919, 1922, 1923/4 and 1930.
unless they had a special deal from the silversmiths at the time. -So where do they live at home? Why have you suddenly decided to bring them in to sell? They live in a box under the stairs. Right. So they're not out on display. They're not out on display, no. and I think the group lot would make probably £200-plus. I'd suggest an estimate spanning that, so 150-250 as a guide price. I would put the reserve at 150. They'll make more. What would you do with the money? Anything in particular? I can't think of anything off the top of my head? -Yes, I have a daughter. Well, she needs a flute stand so she might get a flute stand. That's about a tenner, isn't it? today a nice little mixed-media work by Emmanuel Levy. Tell me, where did you get it? -I picked it up as payment for a job I did. -What kind of job was it? It was just a clearance job. I helped someone move house. Do you do that as a living? What do you do for a living? I do a lot of clearance jobs, I help people when they move house. as part of a job that I helped someone out with. -Did you choose it yourself? ANITA LAUGHS I'm quite persuasive! Do you like art? Do you like pictures? Yeah, I collect art. I do enjoy it. -What drew you to this picture? I like the composition. I like all the people. -I like the thought that it has a bit of history behind it. Emmanuel Levy was a Manchester artist. He lived 1900 to, I think, '96. So he lived for a long, long time. and he was also an art critic for the Manchester Evening News. So he was an artist of some stature. it's maybe been added to afterwards. It was done in Paris in 1930.
and he quite possibly went over there just to be part of the scene. when he was on the Metro. Tell me why you like it. a study, isn't it, and no doubt a good one because he's framed it. But, yeah, it looks to me like some sort of study of the people. -I find it really interesting. -He's very good with the figures here. -And I think that it is charming because of that. But I would be tempted to keep my estimate fairly modest. would you be happy to sell it within that estimate? I would be happy to put it to auction with that estimate, I think. -Would you like a reserve price on it? -Did you pluck it off the wall to bring along here? So I would like a reserve of sorts. Shall we put £100 with a little bit of discretion? So, £100-£150, reserve £100, with a little bit of discretion. -And let's hope that it flies away. What would you do with the money? Will you buy more art? -It's my brother's wedding this year. So I've got to put something aside for... Possibly a painting for him. I hope he doesn't like this, though! -Oh, well, it's going to auction anyway. Before we head off to auction, I'm going to explore a local landmark. Antony Gormley, is a striking piece of public art. But its existence has been met with some considerable controversy. is that people don't want this statue. to its home in Gateshead, the area was ravaged by unemployment. had left a chasm of despair in the community. costing nearly £1 million, arose. I know they won't, and they haven't. But I still think you could. Oh, it was going to be 300 to start with. And that wasn't a bargain either. I think they could spend that money on better stuff than that, like. was around in the early days of the Angel. -the Angel Of The North back in the '90s? -There was a sense of risk. so, "Can we do this? Should we do this?" actually called himself a Philistine, an arts Philistine. But he was from a mining heritage. So everybody in the council was on board with this, eventually. felt that the money should have been spent on community art projects. would you spend such a huge sum of money on one single piece of art? individual groups and community groups are actually more involved? at the history of Gateshead, it wasn't one thing or the other. as well as community art. if we hadn't done the Angel. and we just wouldn't have got it for other things. For its creator, Antony Gormley, the Angel is about many things. coal miners worked for two centuries. And the area's renowned for its shipbuilding. transition between the industrial age and the age of information. It certainly has an incredibly strong presence. Some have described it as magical, and even spiritual. because no-one has ever seen one, and we need to keep imagining them. of a modern-day saviour for a disenfranchised generation. raised morale, and given many people a sense of pride in Gateshead. accepted Antony Gormley's sculpture as their own. Making it the people's art, as it was always intended. NEWSREADER: It was six in the morning. but it lasted just 20 minutes. and as the long arm of the law closed in, the shirt was removed. But even the officers got a kick out of it. but it's also really done some good for the Angel. now it's had a Newcastle shirt on. For me, I think it just represents home. it's one of the first things you see on the motorway. "Let's actually going see it up close and personal." I love it. I just love it. I think it's beautiful. the fact that it's this big, rusty, metal, beautiful object. and stuff like that, of the north-east. which is part of my heritage? Or do we actually try to create a new one? And that's what we've been trying to do. The Angel symbolises that. a change of heart, and now can't imagine Gateshead without it. and getting rid of it, or New York getting rid of the Statue Of Liberty. It's a symbol for that city, and this is now a symbol for our area. in front of the bulldozer, saying, "Over my dead body." ourselves of what we're about to take off to auction. appeal to someone with an eye for the ornate? Time's ticking on for Joan's Elgin watch. it's sure to find its way into someone's pocket. draw in collectors of the Northern or Manchester school. find a new home in the 21st century? once known for its thriving coal industry. I'm feeling optimistic about today's auction. and the room is already full of bidders. This lot are here to buy, fingers crossed, our lots. Time to catch up with our first sellers. I hope we get the top end of the estimate. by Emmanuel Levy, a Manchester artist. Fingers crossed there's a few phone lines booked from Manchester. Because the Northern School love their stuff. They really do. -In fact, I like this. And I reckon you like this. a really good explanation of why you want to sell this and not keep it. and it was one of a selection, to be honest. -It could have a bit of potential this, couldn't it? Yeah, it's a lovely little picture, and the subject is charming. You're looking at around £120, aren't you? £130 or £140? -We want as much as possible. We all want as much as possible. Let's find out what the bidders think of it. -That's what you've come for, isn't it? The Emmanuel Levy, the pastel, the French underground. And I'm bid £50 to start it. At 50, at 55. No? At 120, we're back downstairs. At £120, the internet's quiet. At £120. All told, at 120. -The hammer's has gone down, 120. Yeah, I'm happy with that. It looks like someone nice has got it. and hopefully you'll get a lot more. -and these things come along? Keeping the auction rooms busy, that's what he's doing, isn't he?! dating from the early 1900s. Sally, it's great to see you again. A unique item. cos it's a rich man's sport. -And you've passed me this picture before. -Gosh, look at that. What a fine man. Lovely to see, isn't it? This is the man that owned those trophies. -Where he won the trophies? There's a bit of sentimental attachment there. Are you sad to let go of these? -What's the point of that? and they're going under the hammer...right now. At 260 it's with me. You're all out. Anybody on the net? -That's not bad - top end. And they're gone. Hammer's gone down. -Yeah, that's not a bad result, is it? It's better than being in a cupboard under the stairs doing nothing. Well, that was a great way to kick off the auction. Let's hope things stay buoyant for our next seller. Going under the hammer right now, we have Joan's booty of gold. you'd be dragging it along the road. There's such a lot of gold here. the gold watch, the pendant, the coin. Whose was this? Not yours, obviously, was it? No, it was my grandfather's. He must have been a big guy to wear all of that! -He wore it every day. Hey, do you know? That's a fair answer, isn't it? That's a really good answer. I've had it a long time. but obviously we're looking at melt value as a bottom line. You've got to take the weight consideration in. and hopefully we will reach our reserve price. Yeah, as we always say. 9-carat watch chain and the Elgin pocket watch, the plated one. I'm bid 300 to start with. 460, yes or no, anybody? -It's within estimate - we're happy. -Thank you very much. Thank you, Anita. Oh, I'm so pleased it did well. Spot on there, Anita, with that valuation. And Joan's got what she wanted - some cash. Coming up, a collection entrenched with history. and we've got a bit of carving going under the hammer. -A bit of Chinese carving by you, Sheila. -Linda, you've got the carved coconuts. -You are really good friends. -That's why we did the valuation together. because this could be a rollercoaster ride. Do you know what? I think we're going to sell both of these items. I think we're going to be all right. I think we're going to be all right. -You're up first, aren't you? and I bid 20 to start it. Just over the top end. He nods and shakes his head at the back of the room. Right, let's see what we can do for you. Here we go. The carved 19th century coconuts and stands, with the bases as well. We're off again. I have two commissioned bids. I've got it started at 130. 190. We're in the room, on the left, at 190. But it's a pair, Linda. There's a premium on the pair. £190. Are we all done, ladies and gentlemen? Well, I think you came out on top, Linda. I really like those coconuts. I'm pleased they made over £100. Thank you. We've really enjoyed everything. we've had a good first visit to the auction house. Our first lots done and dusted under the hammer, and some happy owners. of Tyneside have been crossing this stretch of water for many centuries. the side I started, over there, across the river to North Shields. and of horses being transported across here during the 15th century. the trip across this stretch of water. with workers who had to get backwards and forwards. Nowadays, the ferry is mainly used for tourism and leisure. As you can see, it is pretty much empty. But back in the day, it would have been jam-packed. becoming the fastest and most popular way of crossing the river. and one from the beginning of the 21st century. providing hundreds of jobs at a time of mass unemployment. The aim was to reduced congestion. and the men risked their lives in its construction. It's incredible that not more than one man lost his life. mark on the landscape here and the locals absolutely love it. The Queen and I thank you for your loyal and dutiful address. to visit Gateshead on the occasion of opening the new bridge. in the industrial development of Great Britain. I pray that with God's blessing, more prosperous times may soon return. The bridge was overrun with people when it opened. and everyone was out in force to celebrate their new bridge. The year 2000 saw another iconic bridge grace the skyline. due to its shape and tilting method. become run down, giving it a fresh and new 20th-century feel. around noon every day, and who knows? They might let me push a few buttons. -Hi, guys. Hello. Am I just in time? -You are just in time. -What time do you normally tilt the bridge? -It takes approximately four and a half minutes. -That's not long at all, is it? -It isn't, no, for the size of it. It works on hydraulic rams. -and basically, the hydraulic pushes it on the axle and it tilts. 12 o'clock comes and they know when to cross and when not to cross. -We get people from all over the world coming still. -Again, it is the only tilting bridge in the world. -That's cutting-edge architecture, isn't it? -It is. Without a doubt. -Do you know, it actually marries in with the old bridges quite well. You've got a bit of the ancient and a bit of the modern. You've got the new with the old. It fits in perfectly. -Are you proud of this? -Is it push a button? -Yes. We push a button. This is possibly the most important button I've ever pushed in my life. Just look how smoothly and gracefully the bridge tilts. It's not surprising that it won the prestigious Stirling architectural award in 2002.
but it still performs the important function of enabling boats to pass up and down the river. an internationally acclaimed cultural centre. is a state-of-the-art concert hall. a modern link to this bold new area. and with people from further afield. Who could fail to be impressed with this marvellous structure? Adding a new dimension to an already iconic skyline. originally built in 1899 for the Co-operative Wholesale Society. with these wonderful floating steel arches spanning this room. This is exactly what you'd find in a railway station of the same period. British craftsmanship and Great British engineering. from all around the world and very close to home. 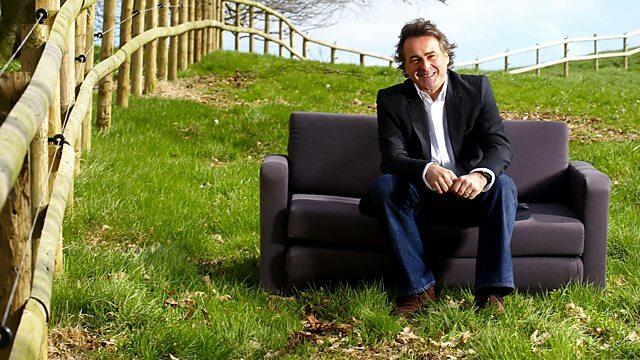 Welcome to 'Flog It!' and it's really lovely to have you along. You've brought in an autograph book. Now, whose book is it? It's my book but both of our autographs. -There is a few autographs from me. -So both of you were autograph collectors? -Is that what brought you together? that are in people's autograph books. were signed by the secretary or the cleaner or something like that. -But what you've got here are ones that you've collected. -and it's at the Grand Hotel, Tynemouth and that's in 1952.
and Oliver Hardy. What's happening there? Well, we were both there separately but we were only 12 years old. And we didn't know each other then. because he's cleverer than me. and then coming together and getting married and so on and so forth. So, we have a wee collection here and we have Frank Bruno. -I think, to be honest, it was my son. Right, OK. And we've got Richard Nixon here. Tell me the occasion this was got. -What did you say to him? I just said, "May I have your autograph, Mr Nixon?" -And he just sort of looked at me and glowered. He wasn't very happy but he signed it. -Were you both movie guys, you know, when you were kids? -And of course, Laurel and Hardy. -I just loved them, yes. But of course, was it Laurel who came from Tyneside? -Stan Laurel came from Tyneside? -There is actually a statue of him there in North Shields. -They were so good, weren't they? -and your history as children. Why do you want to get rid of them now? Well, the family aren't really interested in them and we're getting on. Are you getting on? I wouldn't believe that. -we would give the money to charity. So pass them on and let some other collector have the pleasure. Let some other collector enjoy then, yes. There are a lot of Stan Laurel and Oliver Hardy fans, as well. Of course. Especially in this area. the region of a couple of hundred pounds - would that sort of...? would you like me to put a reserve on them? Yes, I think so, please. Yes. We'll put a reserve, maybe 180, with a little bit of discretion. Well, I hope we get lots of money for your charity. -And thank you so much for coming along. -and here's another piece with a north-eastern history. This is a most unusual-looking item. can you tell me what you know about it, where you got it from? -I bought it from an antique fair several years ago. It's a Durham Light Infantry menu carousel. It's the bugle emblem from the Durham Light Infantry. officers' table with the cards in there, indicating what the menu was. -So have you ever been to a regimental dinner? -I come from engineering that my father was in the Durham Light Infantry during the war. -"Oh, Father was in the Durham Light Infantry." "There's a piece of Durham Light Infantry." And what have you done with it since? The wife didn't exactly like that. Did you suggest to her that she could do a menu for you every day of the week in there? -That would have gone down well, wouldn't it? -I wouldn't be here now. -And we just haven't got anywhere to display it. -Oh, no. Everybody is in the wardrobe. Goodness me. Well to me, it looks as if it is between the two wars. -The style of it says to me '20s, '30s. -It is very nicely made. Beautiful quality. Not a nail in there, is there? I think it's all dowel pegged. And mahogany. -Yes, all these mahogany panels. -But lovely quality thing and it's a good spinner, isn't it? -It is a very good spinner. I wondered what sort of thing it has seen in the past. I'd love to know what a regimental dinner was like. Well, my father used to go to them, obviously. But I've never been to one and the regiment was disbanded in 1968. -1968, the regiment was disbanded, OK.
and your wife won't allow it the table. -You didn't want to put your foot down? -No! Goodness, no! No, no. -you put it on to 'Flog it!'? -If it goes, she will be. Now, interesting item. I don't think that the value is huge. -Firstly, what did you pay for it? -It's not a great value. because it's local interest, Durham Light Infantry. Because I can't recall having seen one before. -So, what is it going to fetch? -That's what I thought when I saw it. I don't think it's going to be much more than that. -Do you want a reserve on it? -Bit of leeway or leave it fixed 30? £30, bit of discretion. And let's give it a whirl at the auction. I'm looking forward to seeing how it sells. what's for lunch so I'm going to have to go, David. Thanks for coming. -Jenny, welcome to 'Flog it!'. to see these two wee chookie birdies sitting on the table. They are a pair of little posy holders. Tell me where you got them. I found them in a car-boot sale. I can't remember whether they were £1 or £1.20 each. What drew you to them? but I don't they're much use as a vase. a bird in your hand. -Yes, yes. And they had to come home. -And you couldn't resist them. Now, they are Royal Copenhagen. and did you know that Royal Copenhagen was a quality factory? but I didn't know that it was Royal Copenhagen, until I got them home. -But that's not why I bought them. -You bought them because you liked them. so they have been going for a long time. and he was one of the artistic directors in Copenhagen. These little birds come from the 1960s. and these rather muted colours. the quality of its design work. What kind of birds do they put you in mind of? because we were, very much, pigeon-fancying country. -"to remind me of my own." Let's have a wee look at stamp here. We see the symbol for Royal Copenhagen there. this was the range of wares. How long have you had them, Jenny? Probably about 15 years now. As long as that? Why are you thinking of selling them now? and he doesn't like them, so they're in a box. -And it's a waste, really. It's a waste. I would put an estimate of 100 to 150 on this pair. Would you be happy to sell them within that estimate? I think I would, with difficulty. Although, to me, they're worth more than that. But, yes, yes. Some things have got to go. -Shall we put a reserve price on them. We'll put £100 firm reserve on them. and we hope that's what happens. If they don't make that, they'll fly back to their mum. Are you going to reveal what you've brought? Well, I've got a nice table I fetched. -Are you going to have a look at it? Now, tell me where you got it from. -Well, I got it from the second-hand shop. -I says, "I'll have that." I didn't know how much it was. -And he says, "Give us 40 quid for it." -What time does it shut? -Oh. Well, I think that's a great buy. -I think so. It's lovely. It's not of any great age but it's lovely quality. Mahogany. -I like the legs of this. -And the quality under here. You've got a US patent number under there as well. And what I also like is the detail round the base. Look at the way that's finished. Oh, look, the banding and everything. -It's a very nice quality table. -The four feet as well. And a drawer. -There you go, the plaque. -Earl Spencer, first lord of the admiralty. It's got a bit of a naval feel to it. And that's the makers, is it? -They were established in 1847? -But I don't know if they're still going. -I don't know, I'm not sure. It's just...it looks like it's quality, that's all. Beautiful quality. Would have been very expensive in its day. worth more than what you paid. I think that was a real bargain. You should double your money and a bit more. -I'm going to suggest an estimate of £100-£150. -Is that in line with what you thought? Yeah, I was thinking about 150. Yeah. I think it should make 150-ish so, hopefully, we're both right. we should put in reserve on it. -Everybody likes it in here. -Lovely lass saying, "That's lovely, that." than it making 40 quid and then you saying to me afterwards, "You..."
-So let's put a reserve on it. -but I think it'll make a bit more. -Keep an eye out for those bargains, Jim. You've got a good eye. -If you had two good eyes you'd be unstoppable. their final choice of items to take off to the auction rooms. our host venue for today. that are going under the hammer. is sure to appeal to an autograph hunter out there. so David's menu carousel should be to someone's taste. but Charles' mahogany table should still make good money. Jenny's cherished porcelain birds fly the coop? We're back in Boldon for our last visit to the auction. and Jenny's hoping her birds will be well-loved. Why are you selling these little birds? -Just to enjoy the moment. Her husband wants her to get rid of them as well. -You've got too much stuff. I think they're great spill vases - something I'd like to own. Right, I think we've got work to do, don't you? Let's put them under the hammer. Let's test this value. The pair of Copenhagen Columbine flower vases. -I'll start straight in at £100. 130. The bid is upstairs at 130. 140, anybody? At £130, last chance? -They're gone. They've flown the nest. Oh, dear! Oh, no. We've got a tear in our eye. from the Durham Light Infantry, belonging to David. Any military connections in the family? My father served in the 7th Battalion DLI during the war. -How did come by this then? -I got it at an antiques fair. -Can you tell us how much you paid for it? Well, hopefully we'll get a bit more than that. Well, it's local, isn't it? Relatively local, and military interest. So I think this should be the best place to get the right money for it. -Properly cabinet-maker made, I think. We'll find out what it does right now. The Durham Light Infantry mahogany table carousel - the menu carousel. And I've got commissioned bids. 40 right by the door. -I hope this goes to a collector. Somebody with connections to the Durham Light Infantry. The internet is quiet. All done? Hammer's gone down. £50. We're very happy. Thank you for bringing that in. That's a one-off. -You won't see another, will you? Well, David's made his money back. Now, it isn't old but it's a beautiful piece. but the quality is there. And it looks jolly good. And it's the right size to fit any house. or a new-build, it will look great. I think so. It's a handy little table. to be worth coming on. -And, you know, in 100 years that'll be an antique, won't it? Anyway, it's going under the hammer right now. We have the Earl Spencer occasional table. -I have two commission bids. We are straight in at 140. 230, the bid is upstairs to the left. -That's what it's all about, you see? That is a useful piece of kit that will become very practical. -I think it was quite...quite a bargain. -Went in here. I seen it...bang. -I'm going to have that. Even good reproduction has quality. Our next sellers have delivered us a legendary line-up. and we're about to find out. and we have a book of autographs with some classic ones in there! Laurel and Hardy we've seen before on the show. Great to see you both again. Big smiles. We've been waiting for this event. Why are you selling this? and give it to a charity. and they've realised around £150-£200. So fingers crossed we'll get the top end here. Well, I'm hoping that we are. Both of these guys were avid autograph hunters. So let's hope they do well. The collection of Stan Laurel and Oliver Hardy signatures. I have one, two, three, four bids. -Wow, that's good, isn't it? At £300, the maiden bid's going to get it? At £300. Is anybody in the room? -You were right. Spot on with the top end of the estimate. You said 280, didn't you? There were lots of autographs in this. -You can split it up. got some money back and may be kept two or three for himself. -Thank you for bringing it on. -Well done, I'm so happy! A wonderful outcome for Heather and Robert's charity. and it's all over. We've had a fabulous time here. and it's not easy putting a value on an antique, as you know. rich in heritage - it's time to say goodbye from the north-east. Paul Martin presents from the Discovery Museum in Newcastle upon Tyne, where he is joined by experts Anita Manning and Adam Partridge. Together the team pick out a selection of interesting antiques to be sold at a local auction, including a book of autographs with a local connection. Paul also finds out about the history of some of the wonderful crossings over the River Tyne, dating back to the 14th century, and discovers what the people of Tyneside make of Antony Gormley's Angel of the North 15 years on.